The new Baltimore-based whiskey company Sagamore Spirit announced that will be the official spirit sponsor of Light City Baltimore which runs March 31 through April 8, 2017. The events signature cocktail will be determined by a cocktail competition held by the Baltimore Bartenders’ Guild. Last year, the official Light City cocktail was the Blue Hour, created with Van Gogh gin, grapefruit liqueur, lime juice, cardamom bitters and tonic by B&O American Brasserie’s Eric Fooy. Sagamore Spirit will provide a local spin on the event’s signature drink this year, being a local whiskey brand with a growing footprint in the regional and national market. 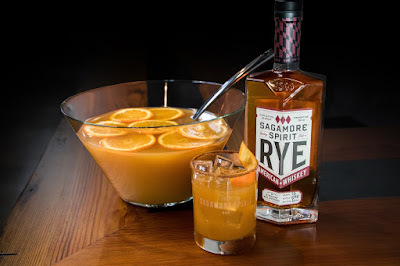 You don’t have to wait until Light City Baltimore for a signature cocktail from Sagamore Spirit, they have created the Passing Game Punch just in time for your Super Bowl Party. 1. Peel one orange in twists to be used as a twist garnish for glasses, set twists and orange to the side as we will use this orange again for juice in the punch. 2. Mix together Apple Cider, Sagamore Spirit Rye, and Bitters in a Large Punch Bowl. This mixture can be held for up to a day or two before serving. 3. Right before serving, add the hard cider, and any additional bitters for taste, and then squeeze your peeled orange into the punch. 4. Cut other orange into wheels as garnish for your punch bowl. 5. Rim glasses with cinnamon. 6. Serve punch over Ice and garnish with a Twist of Orange. Sagamore Spirit currently has two types of rye whiskey available in the market: their signature 83 proof and a cask strength rye whiskey, typically between 111 and 113 proof. Sagamore Spirit can currently be found in select bars, restaurants and liquor stores in Maryland, DC, Delaware, New Jersey, New York and Virginia.